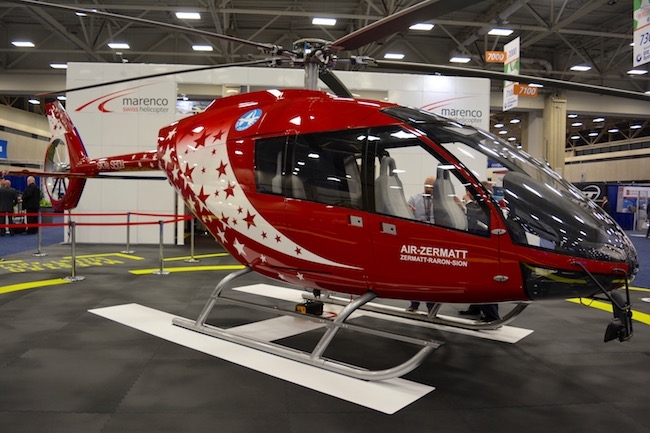 Marenco Swisshelicopter (MSH) is optimistic about 2017 after reaching a new milestone at Heli-Expo 2017 in Dallas, Tx. MSH hit a new commercial milestone at the show with its 101st signed commitment for its SKYe SH09 helicopter. The company has been participating at the event for seven years and continues to experience strong interest and motivation of the market to get the latest testing and development news. Operators all eager to start using the SKYe SH09 helicopter in their respective environments. The additional orders taken in Dallas were signed with various owners and operators from four continents. With the latest signatures destined to undisclosed clients from southern and western U.S., chief commercial officer, Mathias Senes, indicated that this team achievement confirmed the saying about Texas to be accurate – everything is bigger there, especially for MSH. In preparation of the show, MSH ordered a special paint work for the aircraft as its centrepiece. The result was a head-turning dual livery bearing the colours of Air Zermatt and Alpinlift Helikopter, two of the launch customers of the Swiss SKYe SH09 helicopter.